The more I sew, the more I know about my fabric using habits. 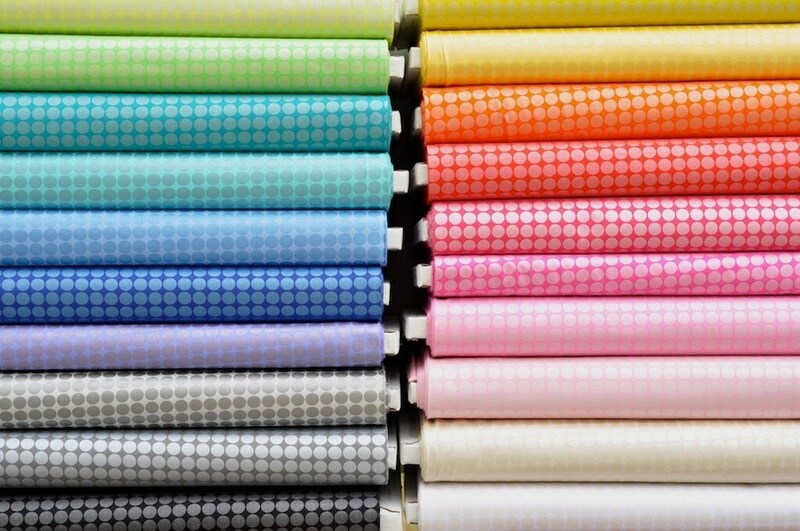 When I first started buying fabric I would buy at least a yard of the fabrics that I liked. Maybe 1/2 yards if I liked the print just ok. The problem is that it breaks my heart to cut into a yard if I only need a little piece. What if I need that full yard one day for a quilt back? Or a bag? So the large cuts languish. Even half yards. But FQs and FEs, those are almost like scraps to me; I can cut those up to my heart's content! I've started buying bundles of the collections that I want to play with. Sometimes I find a print that I love and will buy yardage, but usually I'm satisfied with a bit of each. I bought the FQ bundle of Mirror Ball Dots from Westwood Acres and finally cut into them (I hear she's getting more!). They were prefect to make these little purse accessories for my sewing friends that were in town last weekend. And the linings? AMH Field Study from the FE bundle I bought. It just feel ridiculously good to be using what I have, but also not generating lots of scraps. You want to know what else is ridiculous? Letting Kristie convince you into buying 4 yards of this fabric. What CAN'T you use it for??? Yes, it's metallic gold on white. 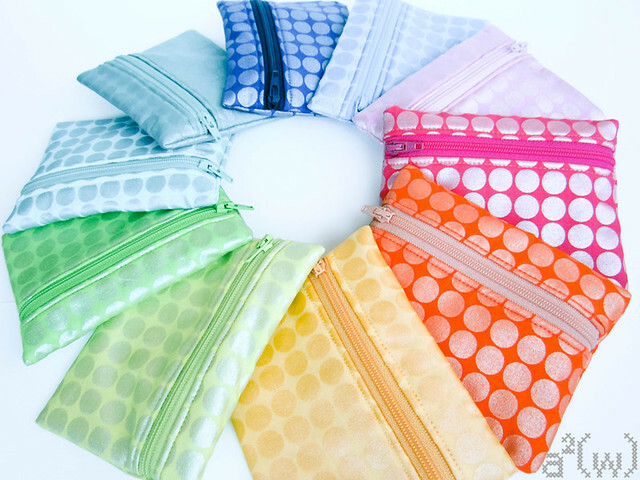 Fabulous little purses - what a great range of colours the Mirror Ball fabric comes in. 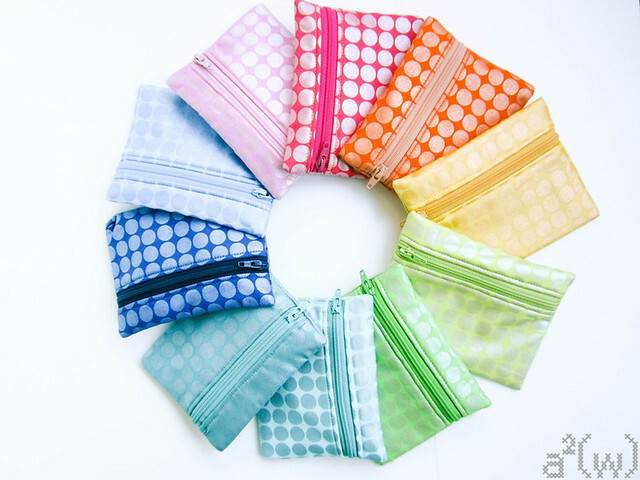 I would be afraid to use the shiny stuff on a quilt, but I love your little bags! very cute! That fabric reminds me of your pretty Christmas quilt. Love! The pouches, the gold metallic fabric, awesomeness! Those bags are so cute! I like that the simple print is on the outside and the "wild' print is in the inside. I like both, but I guess I prefer to carry around something simple instead of "wild", but I often see it the other way with the "wild" on the outside and the simple in the inside. These bags are so classy. I love that these fabrics are making a come back. They are fun to use! LOL! I'm loving Kristie's tattoo comment above! 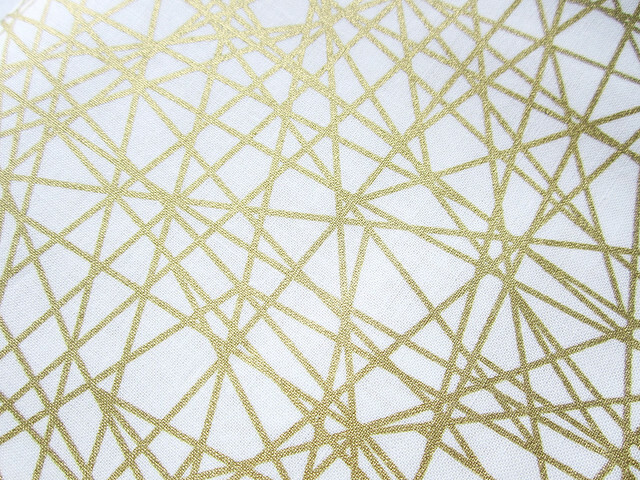 When I glanced at this white fabric with gold stripes I saw a "jungle gym" - where I played when I was a kid. The perspective is as if you are on the ground looking up at it! And the shine on the gold looks like where the sunlight hits the metal. you should add these awesome pouches to the Mirror Ball Dot Pinterest page. The gold and white fabric is gorgeous! Do you know who makes it? LOVE the gold and white stripes, I've search all over and can't seem to find anything like it. So that makes one more admirer looking for information if you have it.